Want instant gratification? Give Kodak a shot! Your parents’ old instant-print camera was so cool and convenient. But in this generation, we need fast performance, digital features, fabulous filters and other cuttingedge capabilities. Now, you can keep things small while still enjoying high-quality imaging, smartphone compatibility and on-the-spot printing. Not to mention, you save a bundle by skipping the expensive inks, toners, paper and other bulky printing paraphernalia. It’s real ink—in an instant! 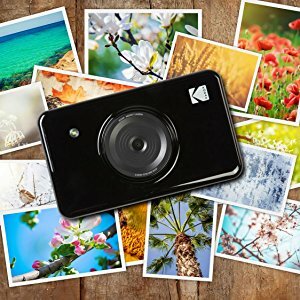 Welcome the Kodak Mini Shot Instant Print Camera. 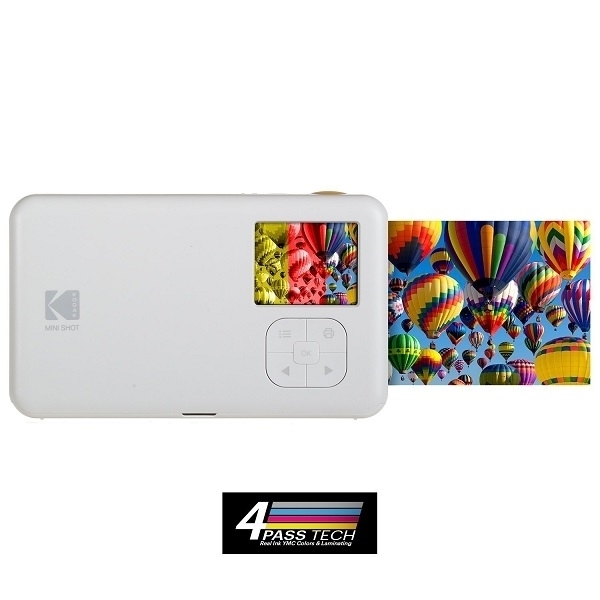 This palm-sized powerhouse utilizes patented 4Pass Printing Technology, also known as dye sublimation, to produce beautiful photographs in seconds. 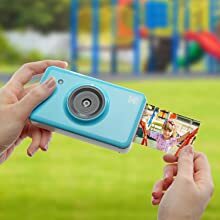 With one of the world’s smallest all-in-one paper and ink cartridges, the camera is perfect for toting along on all your everyday adventures. It’s your turn to call the shots! From home and school to weddings, birthday parties, date nights and foodie excursions, capture your world with 16.7 million colors and an extra protective layer so memories last a lifetime. And the fun doesn’t stop there. 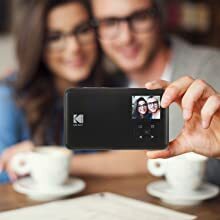 Send snaps to your smartphone via built-in Bluetooth, and you can edit and share on social media for all to admire. 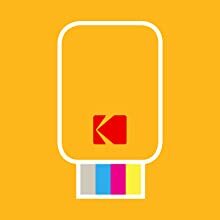 Connect to your iOS or Android device to share on social media and edit on the Kodak app! Despite its slim design, this camera does not skimp on quality! 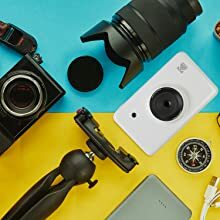 Keep all of your favorite professional features including 10-megapixel resolution, auto-focus, auto exposure, white balance, gamma control and beyond. No more wasted paper! Capture perfect selfies, portraits and landscapes via the easy digital display, which lets you focus, snap, and print only if you approve. You can also choose border, flash and color options right on the screen. 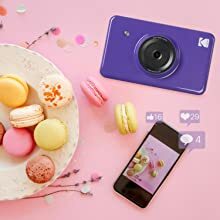 Whether you’re snapping food shots, documenting your dream vacation or sharing family photos, this mini camera is the ultimate social media staple. Bluetooth lets you connect to any iOS or Android device for seamless sharing. 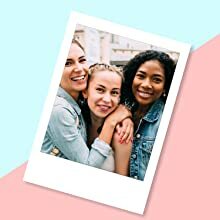 Download the free app to access an extensive collection of filters, stickers, card templates, cropping tools, borders and other editing extras. The app also lets you use your phone as a handy remote shutter, so everyone can get in the shot. Our proprietary 4Pass Printing Technology uses innovative D2T2 heat transfer to distribute color in one continuous tone. A protective overcoat then locks in the lifelike detail, ensuring photos never bleed, blur, fade or rip over time. The things you carry represent you and all your uniqueness. 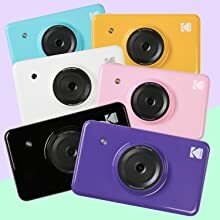 The Kodak Mini Shot now appeals to every shutterbug with a choice of 6 amazing shades of the rainbow. Capture your personality in black, white, blue, pink, purple or yellow. Love the look of those old time photos? Enjoy all the classic elements of an instant print camera with tons of modern benefits. Digital upgrades like auto-focus and gamma correction let you concentrate on the moment—and not on your skills! Weighing next to nothing, this camera is truly everything. 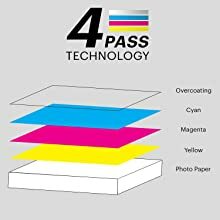 Just slip it in your pocket, and print up to 20 pics per charge. Shots are the size of a credit card, making them ideal for decorating cards, scrapbooks, craft projects, photo albums and more.